Penny Muncaster-Jewell is an international author, teacher and fiber artist. 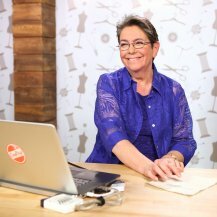 She specializes in teaching PE-Design/Palette, a digitizing software program for creating embroidery designs for computerized embroidery machines, with a reader/writer USB box that is attached to your computer. 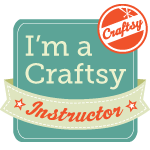 She is proud to say that she has two Craftsy Classes, the latter being launched on September 21, 2015. She was one of the first instructors to be certified through Brother Corporation in PE Design/Palette, and since 1997 she’s been designing digitized patterns both for herself and on commission for other people. She has shared her knowledge with thousand of students all over the US as well as in Australia, New Zealand, Canada and Japan. Always with her wicked sense of humor! Her humor allows the students to relax and enjoy the learning process as well as being entertaining. Her books, Penny's Practical Guide to PE-Design/Pallete and Décor Wizard and Penny's Practical guide to Advanced Projects have been well received. 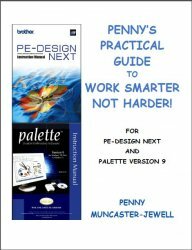 Penny's Practical Guide to Working Smarter NOT Harder- for PE-Design Next and Palette Version 9 is done! The new book shares her wealth of information about the design software which she has used since 1996 when it was first introduced and covers the latest features and capabilities of the latest version of the software. She now has a free addendum for those who have purchased the book and have upgraded to Version 10 f the software. the free addendum for the book that covers the New Version 10 features and changes. 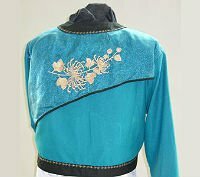 Penny Muncaster-Jewell also belongs to several wearable art groups (her other passion!) She is the leader of the American Sewing Guild Neighborhood group Adventures in Wearables in the Clear lake area. 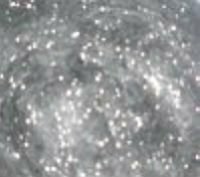 The Sky is not the limit, nor are the stars. It’s your imagination!